The water is strongly connected with the existence of the people and the evolution of civilizations. 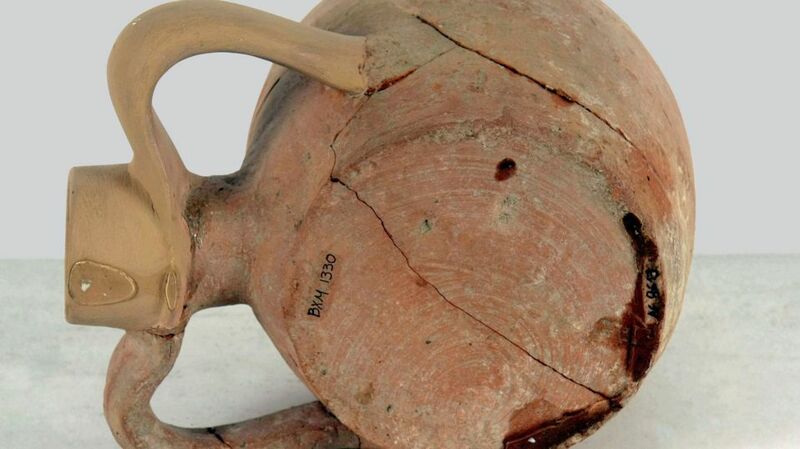 In the Museums all over the world, one can discover more or less obvious water traces. The traces of water that have been tracked down in the Byzantine & Christian Museum form a water path that pass through the material culture and the spiritual life of the Byzantine and post-Byzantine era. Let’s follow it. From the pre-historic years onwards people choose with very specific criteria their place of establishment: they take care not to be exposed to the weather, to the potential enemies, to the attacks by humans or animals; the chose the place to be fertile, and to be near to running drinking water. That is why the settlements and cities are always created near a river or a water source. 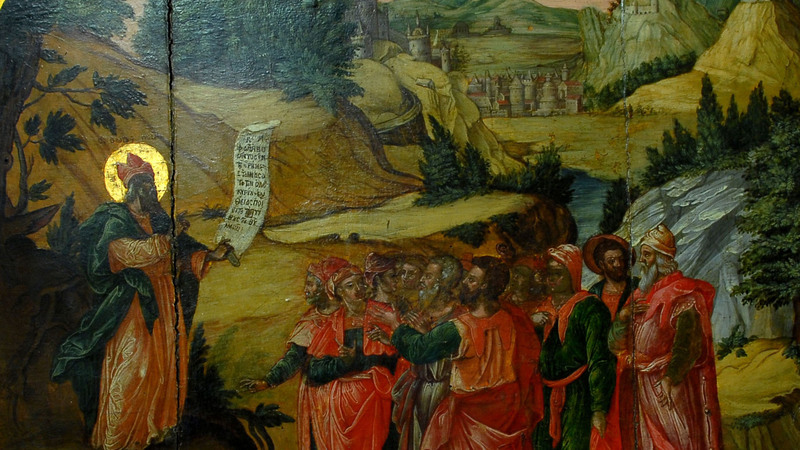 The sermon of the Prophet Isaiah. In the background, a walled city near the river. Closure-panel. Painted by Demetrios Nomikos. From Zakynthos. 1722. 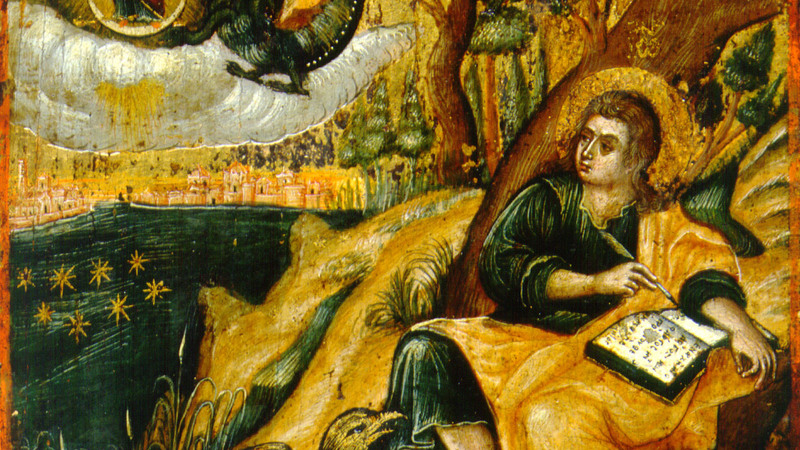 St John the Theologian, writing the book of Revelation. In the back the city of Patmos, built by the sea. Portable icon from the Ionian Islands. 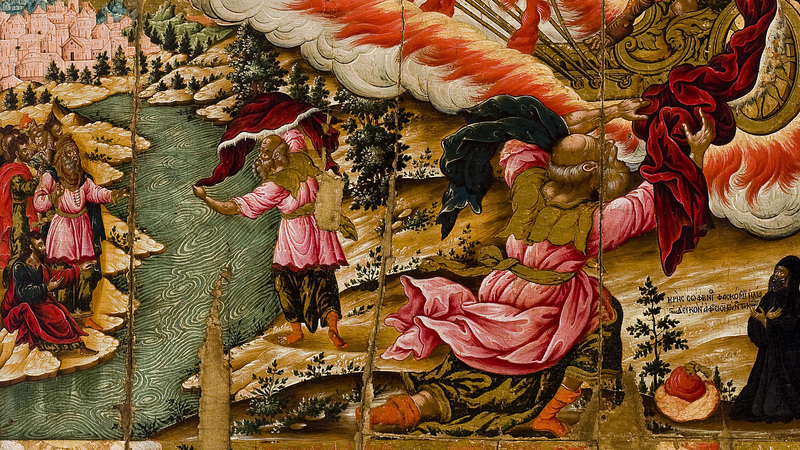 Second half of the 17th c.
The management of water resources is a main concern of organized human societies. The water, "nearon hydor" of the Byzantines, is a source of life for humans, animals and agriculture. In order to use its power, the people in Byzantine and post-Byzantine years built bridges, dams, aqueducts, mills, cisterns, ditches. 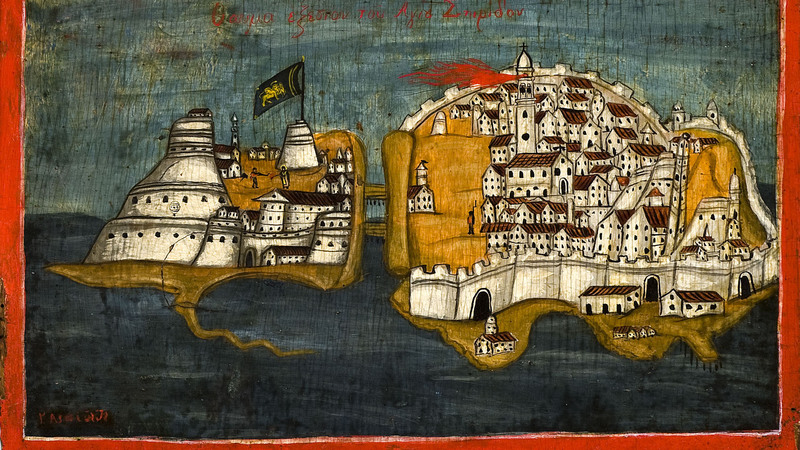 Kerkyra (Corfu Island), with walled densely-built city. 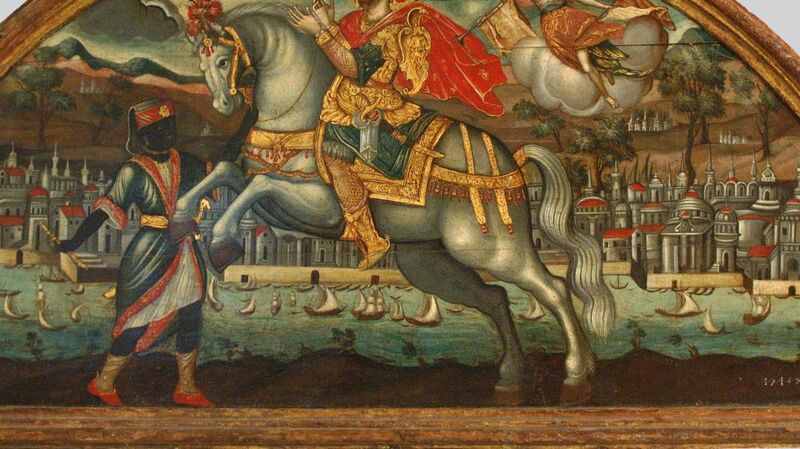 Detail of an icon with the depiction of St Spyridon and his miracle in Kerkyra. Painted by G. Aspiotis. 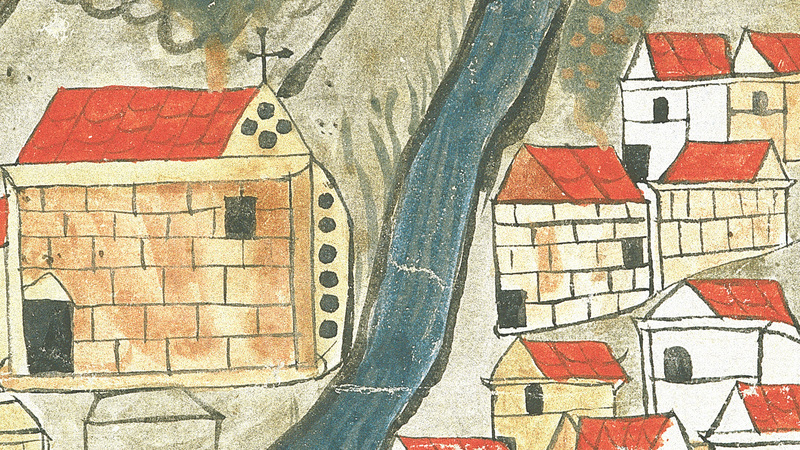 Late 18th c.-early 19th c.
Paper leaf with the depiction of the village Tserkouvitsa, built next to a river. Central role in the community life have the fountains and the buildings in which the water of a source or a pipeline is collected in order to be distributed later. Here the travellers stop to fill their water bags; here the residents are gathered to fill their containers for the needs of the house. Some people use also these facilities for their personal cleanliness. Susanna’s story. A woman bathing in a walled private garden in the city with two men indiscreetly watching her. This biblical scene is common in post-Byzantine art. Painted by Defterevon Sifnios. 1825. A walled garden with a fountain, trees and plants. 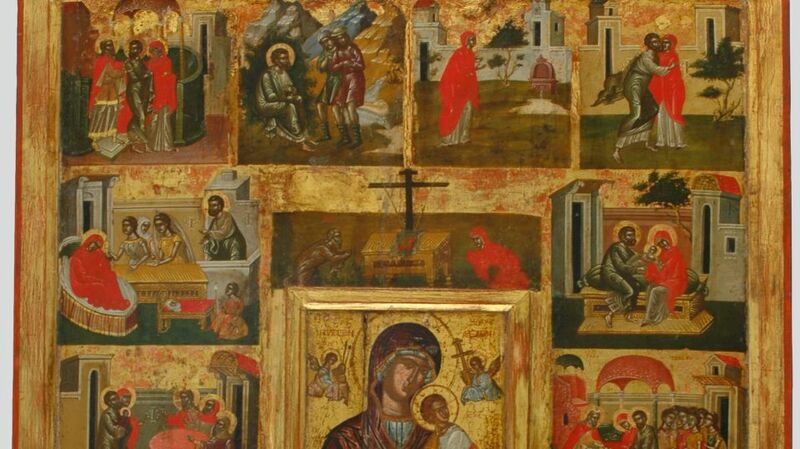 Detail from the prayer of Saint Anna, the mother of the Virgin in a portable Cretan icon depicting scenes from the Life of the Virgin. 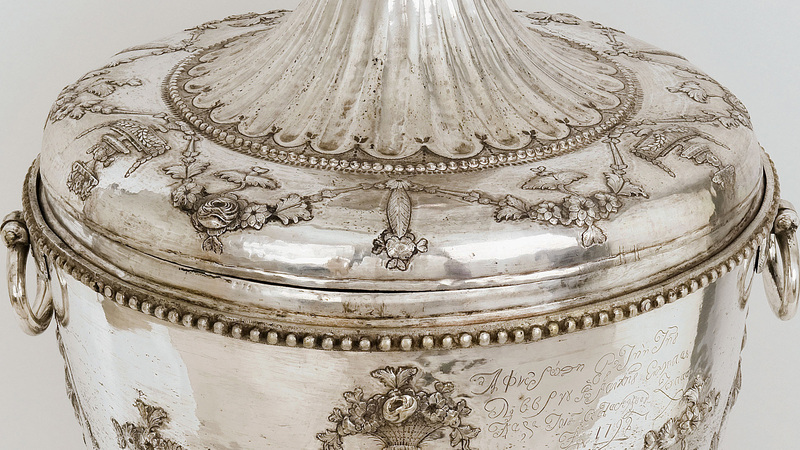 Mid-16th c.
The wide use of of the precious element resulted in the creation of a vriety of containers/vessels, large and small. Others are used for the storage of water in a cool place, others for transport. The containers are made by various materials like leather, clay, metal, etc., while their shape is determined some times by the way they are carried. 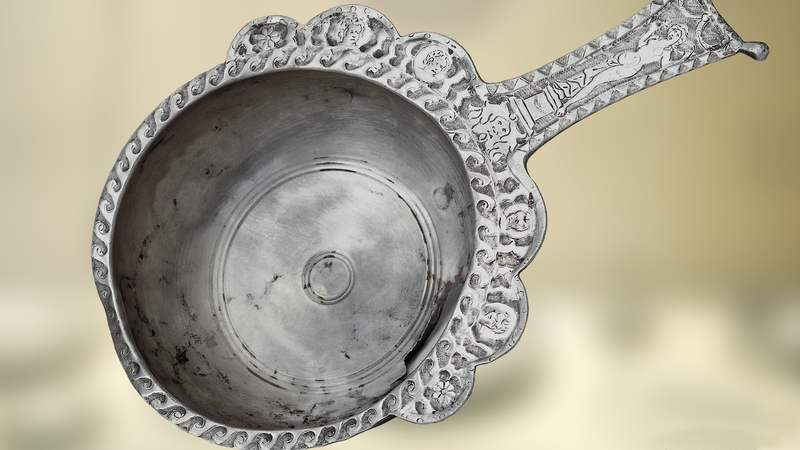 For example, the container called askodaula, has a peculiar shape because it was carried on the saddle of a rider. Maids with vessels for the transport of water. 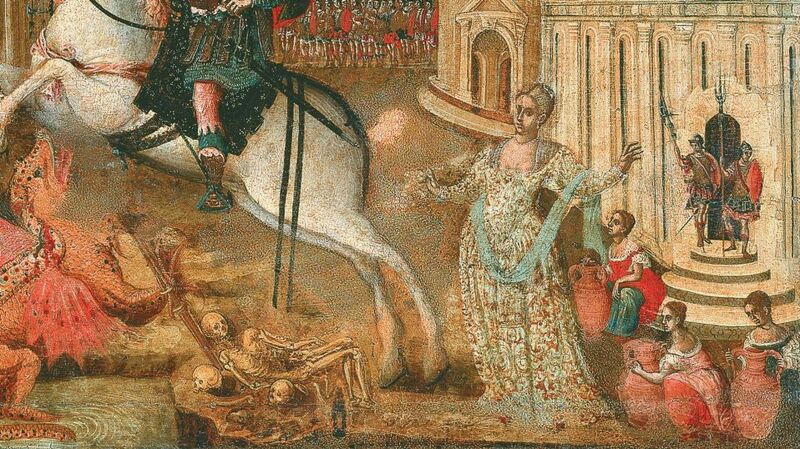 Detail from an icon depicting St George the Dragon-Slayer. 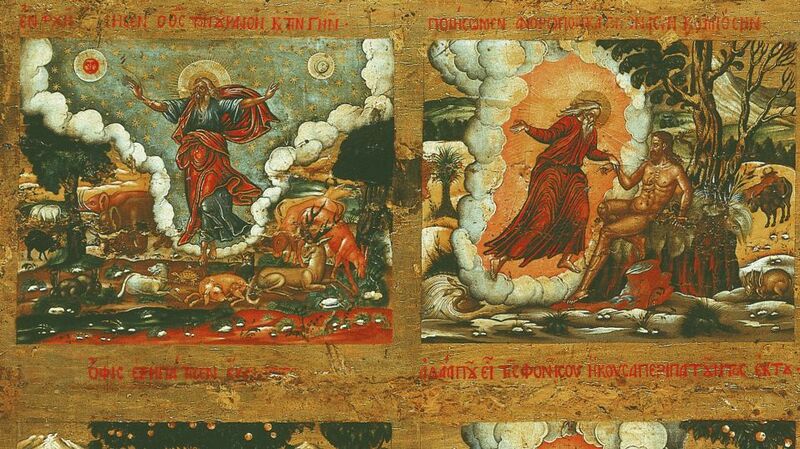 It is attributed to the Cretan painter Georgios Klontzas. 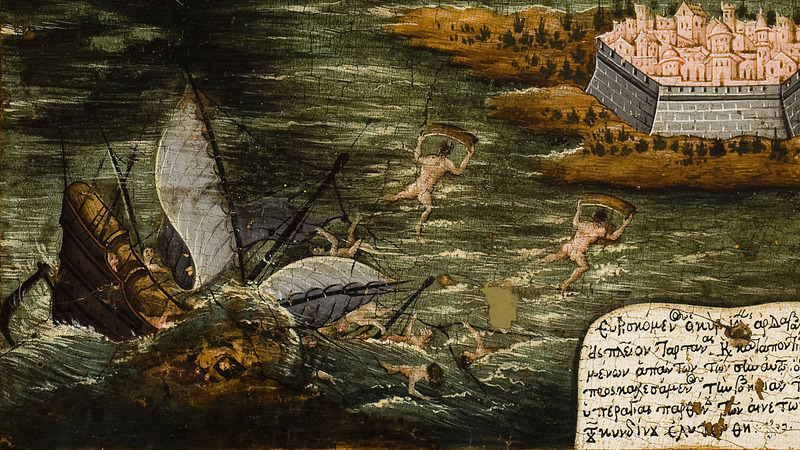 Late 16th c.
Askodaula. 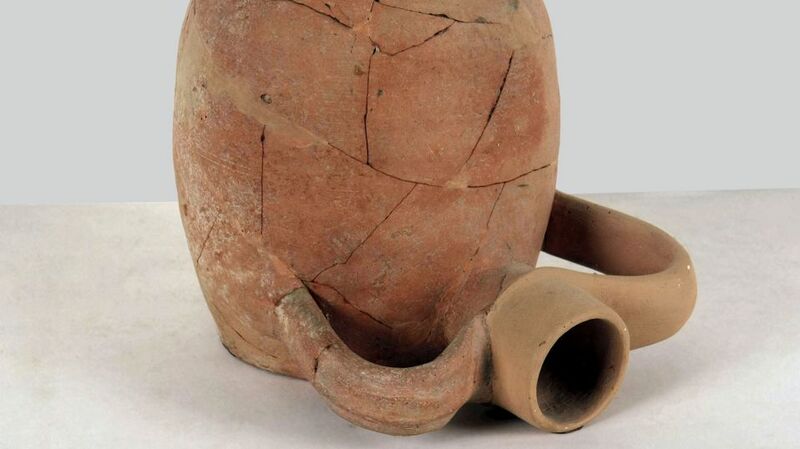 Clay vessel for the transport of water and other beverage. 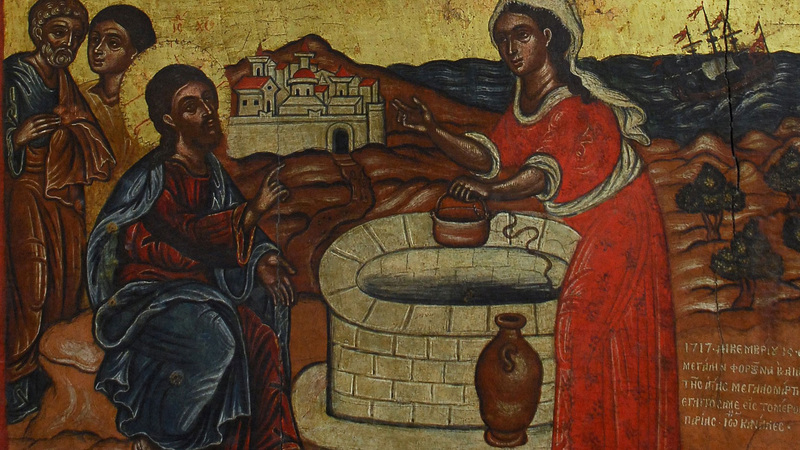 11th-13th c.
Woman drawing water from a well. Detail from an icon depicting the Dormition of the Theotokos and the Samaritan woman's meeting with Jesus. Dated after 1717. 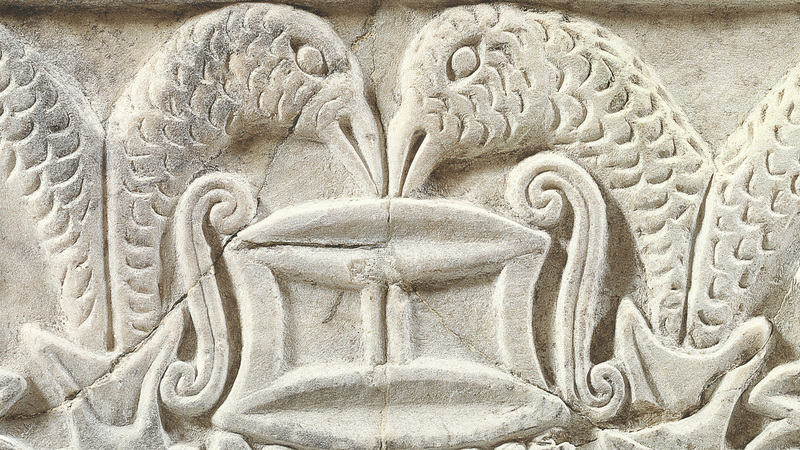 Marble pilaster capital with relief decoration consisting of heads of twin eagles, a cantharus, acanthus half-leaves and rosettes. 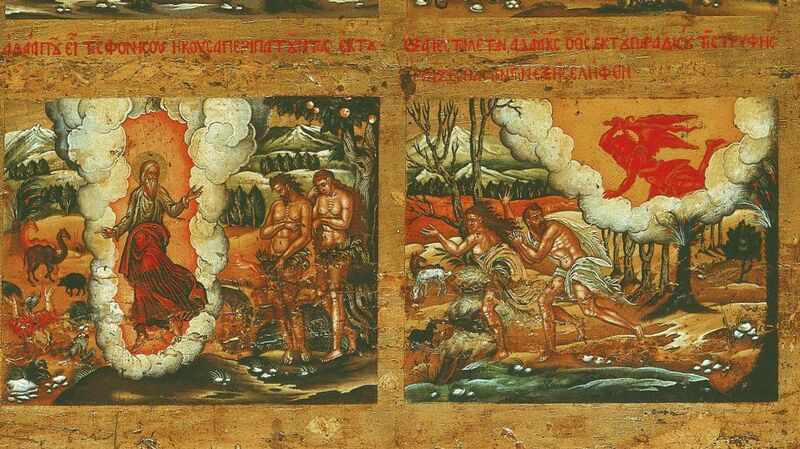 7th-8th c.
The Greco-Roman habit of the use of the public bathhouses continued during the Byzantine Era also. 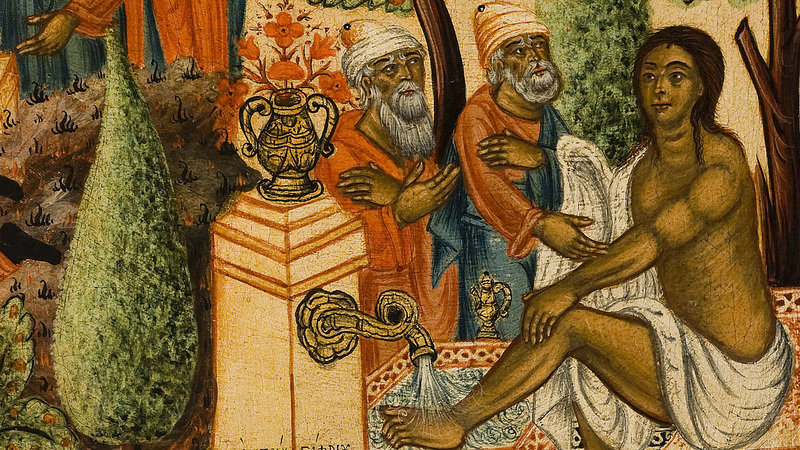 Despite the strong exhortations by the Church Fathers to restrain the excessive care of the body and despite the practical difficulties starting from the late 6th century onwards, when the great aqueducts of the late antiquity were not functional any more, the use of the bathhouses continued mainly in the large urban centres of the Empire. The visit to the bathhouses served not only the needs of cleanliness and hygiene, but it was also an important and enjoyable social activity. Ladle (trulla): silver vessel possibly for use in the bath. Part of the Treasure that was found in Krategos, Mytilene. 7th c.
For Christians, as also for believers of other religions, the cleansing with water is considered as a way of lustration. According to the New Testament, for the first time John the Baptist performed purification with the use of water. In order to commemorate the baptism of Christ by John one of the greatest Christian holidays, the Epiphany, has been introduced. The baptism of the Christians has been established as a sacrament early enough. It is a rite by which the man confesses his faith and then, pure of sins is entering the Church. During the first Christian centuries, the mystery of baptism was taking place in specific buildings, which were called baptisteries. But from the 6th century, when the infant baptism became the dominant practise, the Colymbethra, the baptismal font, becomes a portable vessel of the church. 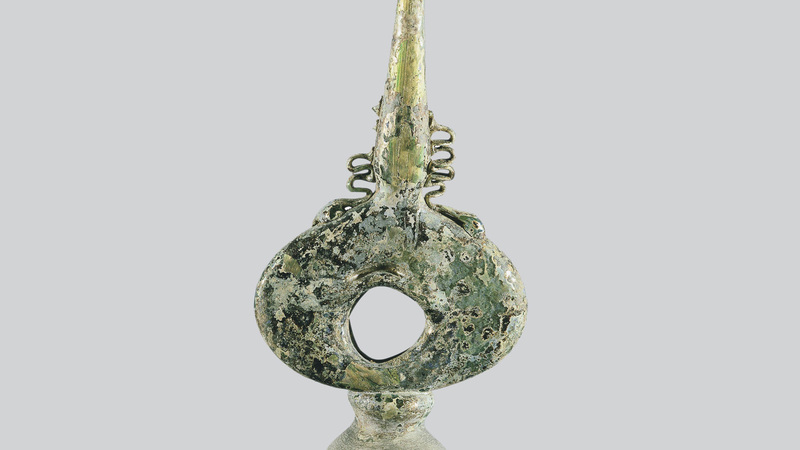 Glass flask, apparently a perirrhanterion (sprinkler) used for ritual aspergation with holy water or myrrh. From Hagios Demetrios basilica in Thessaloniki. 13th-14th c.
Colymbethra (font). From Livorno, Italy. 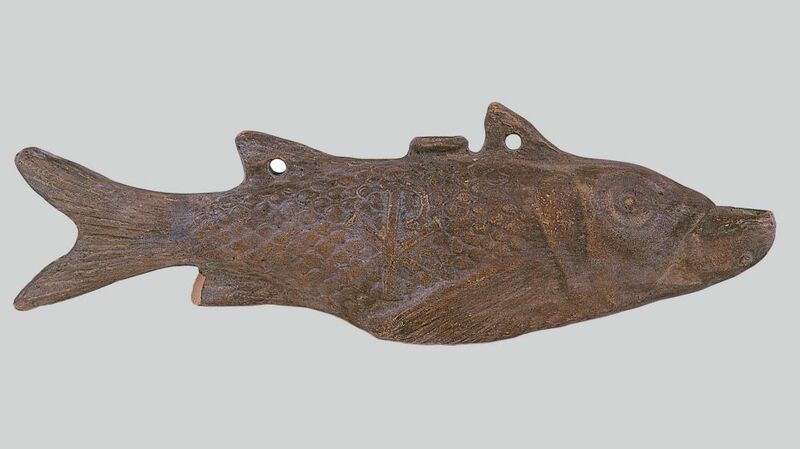 18th c.
Fish-shaped hanging lamp, 4th-5th c.
Like their ancestors of the Greek-Roman Antiquity, the Christians attribute miraculous healing powers to the water that flows from certain springs. These springs, Hagiasmata, are often incorporated in major pilgrimage centers. As for Paradise/Heaven, it is not by chance that the Byzantines used to think that is a marvelous garden with lush vegetation and many springs. Paradise / Heaven is depicted as a garden with lush vegetation and springs. Portable icon with scenes from Genesis. 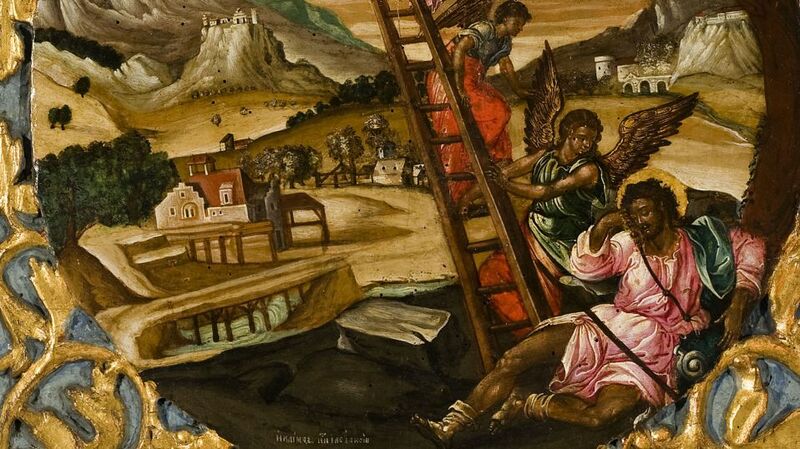 It is attributed to the painter Konstantinos Kontarinis. Early 18th c.